Girls Basketball takes on Mountain View with an impressive win of 62-36. Going into the game, the team was missing one of their teammates Ellie Jeffries (’19), who was out due to sickness which really changed the team dynamic. “We really missed Ellie, but I’m really glad we were able to pull it off.” Esme Stotland (‘19) said. Although the girls were down a teammate, they were especially excited to celebrate this win along with Stotland’s birthday. “Being around my teammates was the best way I could think of to spend my birthday,” said Stotland. The game started out slow, the Vikings up 8-2 three minutes into the quarter. Although they pushed through to end the quarter up by 16-2. Going into the second quarter, the Vikings were still ahead but now by a score of 22-13. Both teams didn’t score anymore points until there were 21 seconds left in the half and Annika made a 3 to break the drought. The vikings end the half with a solid 25-13. The Vikes started the third quarter off strong with Carly Martin scoring to put them at 27-13 in the first thirty-seconds. 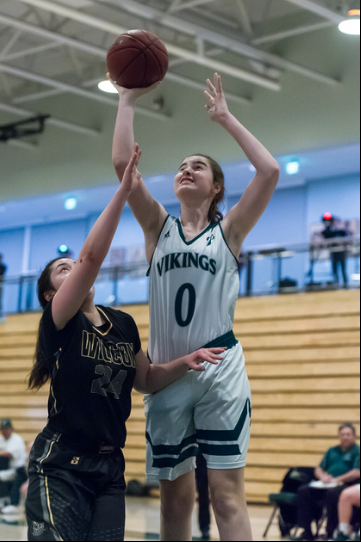 As the quarter continues the Vikings were able bump up their score as Lauren Daniel scores four 3’s and they finish the quarter with a score of 44-23. In the last and final quarter, with 46 seconds left in the game, Llayda Turgut (’21) scores a 3 making the final score 62-36. Turgut was excited through out the game because of the opportunities the game presented to her.